Retire to Sedona... Where numerous Western movies were filmed, offers some of the most spectacular scenery in all of Arizona. The unique color of the sandstone formations, gives Sedona the name, the home of the "Red rocks'...it is one of the most popular tourist destinations in all of Arizona, only an hour and a half drive from Phoenix. Sedona is a small town with only 10,000 year-round residents...up to 5 million tourists visit Sedona every year...half of the land within the city limits is National Forest. Sedona has spectacular scenery...Sedona is definitely not small town America. It is the home to many art galleries...pink four-wheel-drive Jeeps available for tours... New age folks, along with their crystals. That makes Sedona a great place to visit ...for some, not all, that's why there's chocolate and vanilla folks...Sedona is similar to places like Taos, NM... Telluride, Colorado ... Big Sur, California. I enjoyed visiting all these places...and for some Sedona would be a great place to retire. Is it frugal, far from it, but it is one of the most beautiful places in all of Arizona. For that special person, Sedona would be perfect for best Arizona retirement living. The real estate is very expensive...there is much congestion in tourist season. But for certain folks, that's not a bad thing at all. For the artsy and affluent retiree, Sedona would be a great choice for Arizona retirement...If this is you I am sure you will enjoy Sedona and you will have lots of visitors...that I can guarantee you. Retire to Sedona for Arizona wine? Did you know that Arizona is home to 45 wineries? That Arizona wines have been served in the White House? Several of these wineries, are in the Sedona area...enjoy in moderation. Touring the tasting rooms, is a fun way to spend a day...just remember to have a designated driver. Sedona has an elevation of 4300 ft... it snows in the wintertime... but that same mountain air keeps the summertime temperatures in the 90s or 20 degrees cooler than Phoenix...one of the beauties of living in Arizona is the diversity of the climates within a short drive. I fly fish in the winter in Cottonwood 25 miles away from Sedona...I've never been uncomfortable. 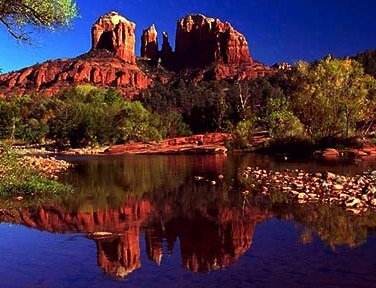 If you are looking to retire in Arizona, and cannot take the Phoenix heat in the summertime, and if your budget can stand it...take a look and retire to Sedona.